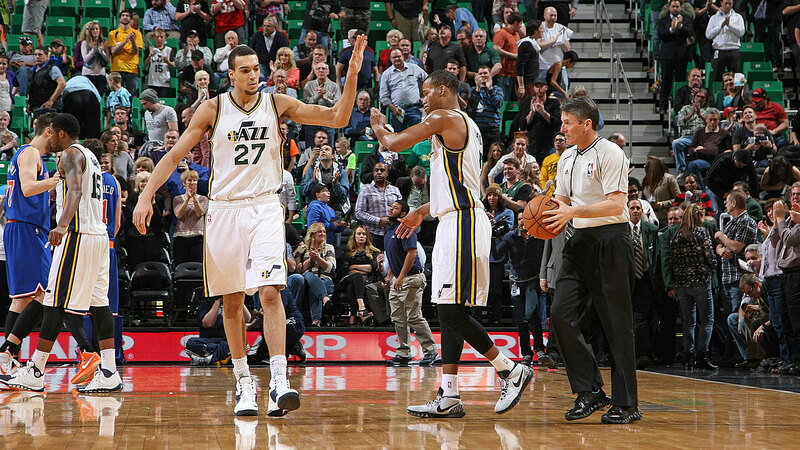 » Hot Jazz: Can Utah Keep Climbing Up the Crowded Western Conference? The Jazz haven’t discovered the divine secret of basketball. They’re not smarter or brighter than any other organization. No sui generis life-form is sprouting up amid the desert salt grass of the Great Salt Lake’s alkali playas. 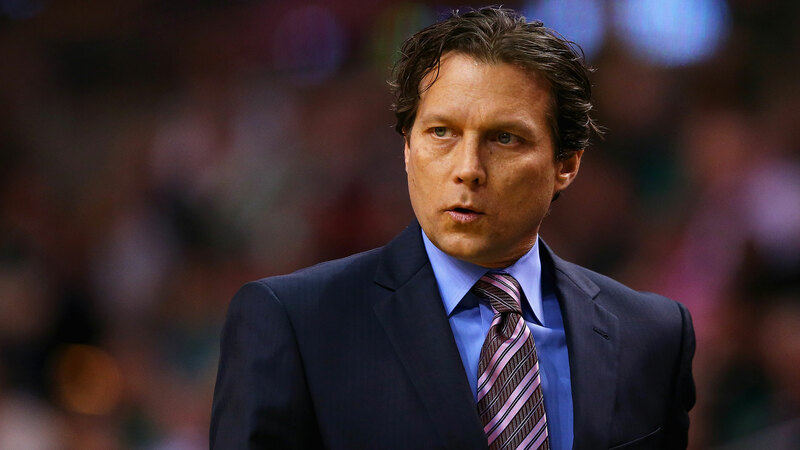 Nope, nothing to see here: “We haven’t figured anything out,” Utah’s first-year coach, Quin Snyder, told Grantland. Except that the Jazz — a franchise assumed to be wallowing in the depths of a rebuild — have dominated the NBA since the All-Star break. Over that stretch, they’ve gone 11-3, suffocating opponents with the league’s top-ranked defense and racking up a higher margin of victory than the Warriors and the Cavs. A team that suffered an 0-9 stretch in late November has recently waxed heavy hitters like Portland, San Antonio, Memphis, and Houston. And if the Jazz played in the Eastern Conference, they’d now be tied for the eighth seed. All very ho-hum for a team whose starting lineup is, on average, a year younger than that of nearby Brigham Young University, right? A conspiratorial type might suspect that Utah has an organizational interest in staying beneath the radar. General manager Dennis Lindsey came aboard in 2012, following a lengthy tenure as an assistant GM in San Antonio, a place where a veil of blandness intentionally obscures the mechanics of the killing machine the Spurs have spent decades constructing. As branches of the Spurs tree extend throughout the league, one continually hears phrases like “The Program” and “The Process” from not only Snyder, but also Atlanta’s Mike Budenholzer and Philadelphia’s Brett Brown, both of whom were assistants to Gregg Popovich. Part of Snyder’s reticence to indulge in his team’s newfound success might be personal. After playing point guard for the Duke Blue Devils in the ’80s, a then-33-year-old Snyder, with his piercing eyes and glorious hair, took over at the University of Missouri in 1999 and promptly led the Tigers to four straight tournament berths. But by 2006, he had resigned in the wake of several disappointing seasons, rumors of impropriety, and three years of probation handed down by the NCAA. Over the last decade, Snyder resuscitated his reputation, coaching the D-League’s Austin Toros and serving as an assistant for the Sixers, Lakers, CSKA Moscow, and Hawks. His coiffure remains intact, but he’s keeping a lower profile. While still not flawless, Utah wasn’t supposed to be this good, this fast. After allowing All-Star big men Al Jefferson and Paul Millsap to bounce in free agency during the 2013 offseason, the Jazz began an overhaul. Locking Hayward and forward Derrick Favors into long-term contracts, they bet on youth. Although those deals initially looked like more cases of a small-market team overpaying just to get someone, the impending torrent of TV money due to capsize the current salary cap makes Favors’s and Hayward’s contracts downright sensible. In addition to the marquee signings, Utah ate a few undesirable veteran contracts in exchange for draft picks, added an assortment of foreign talent along the way, and now has four rookies on the roster. Already, the Jazz are blooming into a younger, westward version of the Pacers, a defensive juggernaut that blockades the paint, pummels shots, manhandles the boards, and scores enough to get the job done. A team can win a lot of games like that. To some degree, Utah’s recent success involves addition by subtraction. At the trade deadline, the Jazz sent starting center (and impending restricted free agent) Enes Kanter and the little-used Steve Novak to Oklahoma City in a three-team deal that brought back Kendrick Perkins (who was soon waived), Grant Jerrett, the rights to FC Barcelona’s Tibor Pleiss, a protected 2017 first-round pick, and a 2017 second-rounder. More important, the move opened up minutes for Rudy Gobert, a 7-foot-2 Frenchman who patrols the paint with a nearly inconceivable 7-foot, 8.5-inch wingspan. Going forward, much of Utah’s ability to elevate its offense will depend on the development of young guards such as Exum, Burke, Rodney Hood, and Alec Burks (who had season-ending shoulder surgery in January). Exum, a 19-year-old point guard from Australia who was taken fifth overall in the 2014 draft, has made strides since being installed into the starting lineup. He’s averaging a modest 4.9 points and 2.3 assists in about 24 minutes a game in his new role, but he has used his 6-foot-6 length to inconvenience opponents at the point of attack. Utah is last in the league in pace, both before the deadline and after.